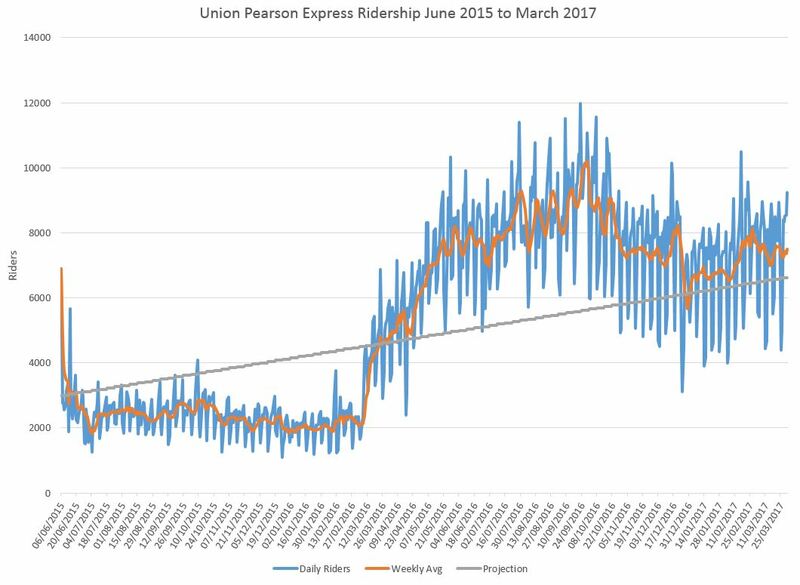 Metrolinx has published ridership stats for the Union Pearson Express to the end of March 2017. These do not break down trips between various points on the line to show what portion of ridership is end-to-end Union-Airport traffic, and what portion travels to or from stations along the way. In this chart the blue line traces daily counts and these show a regular weekly cycle. The total ridership grows after the fare reduction of early 2016 and peaked in September 2016. Except for that peak, and a winter dip from Christmas 2016 to mid-February 2017, the average number of daily riders (on a weekly rolling average, orange) has remained slightly below 8,000. This appears to be the new stable level of ridership with the current fares and service pattern. A related issue is that with some trips on busy days reporting standees, growth during certain periods will be constrained by available capacity. The original projection for UPX was that it would reach 5,000 daily riders after a year’s operation. This it would have abjectly failed to achieve but for the revised tariff. The gray line prorates that projection from the opening week to the first anniversary in June 2016, and then continues on the same rate of increase until March 2017. In the Metrolinx financial statements (to be discussed in a separate post), it is not possible to separate out information for the UPX division, and for management and accounting purposes, this has now been rolled into GO Transit. A note to anyone at Metrolinx who is reading this: When you publish data like this, make it available as a spreadsheet (as well as PDF for general consumption) so that the numbers can easily be extracted and analysed without the need to “scrape” the PDF.